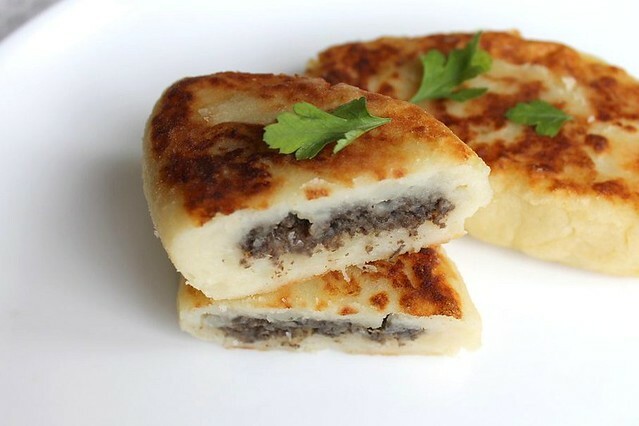 I guess the most popular zrazy are minced meat croquettes, stuffed with something, but this version is mashed potato croquettes with stuffing inside. They can have round or oval shape, but my granny always shaped them as diamonds. She passed away when I was still a child and there is not much I managed to learn from her. However I have a little picture in my mind of these rhombic zrazy, fried to crisp on both sides, piled up on a large platter standing in the middle of a big family celebration table. When I made these the reaciton was very gratifying. Dad liked them and told me a story about his mother. 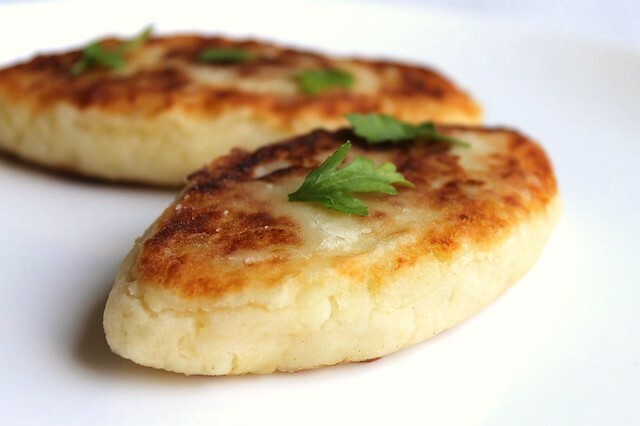 She used to do similar croquettes, but without any stuffing. She would make a sauce of mushrooms and sour cream instead. That sounded good to me in a sense that it must save lots of time. I'll perhaps do the same next time. Mama said they were lovely. When I asked whether they tasted similar to grandma's she didn't remember, so nobody really knows now and you will have to trust me. Place the potatoes into a large saucepan, cover with water, bring to a boil and cook under lid for 20 minutes till soft. Drain and mash them (preferable to use hand masher). Let cool for 10 minutes, mix in the egg, flour and 1 tea spoon of salt. Mash the onion together with mushrooms in a food processor to get raw paste (it doesn't have to be perfectly even). Heat 2 table spoons of oil in a medium pan. Add the onion and mushroom paste, season with salt and pepper and cook on medium heat for around 10 minutes, till it reduces a bit and gets ready to eat. Dust the working surface and your hands with flour. Take two heaped table spoons of mashed potatoes and form a rough ball with your hands. Put the ball on the surface and press it down into a round (about 12 cm in diameter and 7 mm thick). Place 1 table spoon of stuffing in the middle of the round. Gently lift up the sides and close the zraza. Take it in your hands and press gently together to shape a cylinder with pointed endings. Place it on the surface and press down gently (it should get 1.5 cm thick). Dust well with flour from all sides and set aside on a well floured surface. Repeat with the rest of potatoes and stuffing. Set a large pan over medium heat. Add 2-3 table spoons of vegetable oil. When oil is very hot place 2-3 zrazy into the pan and cook for 2-3 minutes a side till they are golden brown. It is important that the pan is well heated otherwise zrazy will stick and turn into a mess. Serve them hot with chilled sour cream and enjoy. these look so delicious - I can't wait to make them!